Allergies! We all know somebody who suffer from them. Doctors often recommend hardwood floors over other floor coverings because they trap less animal dander, dust, pollen, mites and mold, all of which can trigger allergic symptoms and respiratory problems. If you are an allergy sufferer or know someone who is, then you are familiar with the itchy eyes, runny nose, eczema, and rashes caused by allergies. These symptoms can be reduced or cut out completely just by eliminating the sources of allergens. Our advice? Remove carpeting from the bedrooms of allergy sufferers. In fact, natural hardwood floors throughout your entire home make it easier for you to reduce allergens by eliminating a haven for dust mites, all the while keeping your home warm and inviting. Stay healthy and say YES to Hardwood Floors! Want Beautiful Hardwood Floors But Have Dogs? In reality, no real hardwood floor is invincible, there are certain specifications you should keep in mind when choosing a hardwood floor for your pet friendly home. Site Finished vs. Pre-finished Hardwood - When you opt for a prefinished hardwood floor, you're getting a benefit over unfinished hardwood flooring, which is finished onsite, which is a harder, more durable finish. Most of the major manufacturers of hardwood flooring use an Aluminum Oxide finish that creates a stronger surface coating. This combined with the prefinished hardwood planks are cured under UV lights which hardens the coats of finish even more. This gives prefinished hardwood flooring a bit of an edge over site finished flooring in the scratch department. Coloring. - The color of your hardwood flooring won't prevent scratching from dogs' nails, but it will work in your favor to more easily hide scratches and dents. Lighter wood species with a fair amount of grain will have a tendency to camouflage scratches and dents, so they are a lot less noticeable than they would be on a wood with little or no grain or a dark stained hardwood floor. Surface Texture - Surface texture can also help to hide scratches or dents caused by pets in your home. 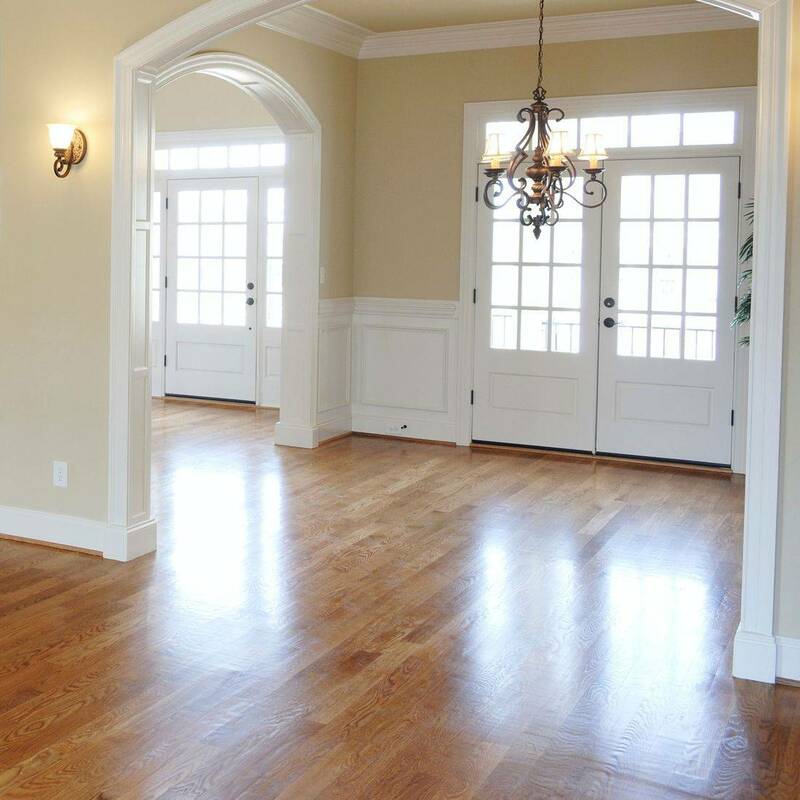 Hand scraped flooring is already textured so the appearance of scratches and dents become minimized as compared to those on a smooth surface hardwood floor. Hardwood Wood Species - Different wood species offer different hardness. There are incredibly soft woods, like American Cherry; and there are incredibly hard woods, like Brazilian Walnut. The hardness of a wood species will determine how drastic a dent will be if something hits the surface of the wood. We've found that natural Maple offers both a beneficial light color and the hardness needed to stand up to busy households with pets. Other light colored and hardwood you may want to consider is Hickory. One of the best things to ever happen to cable television is HGTV. I have to admit I am a little obsessed with it and when I get a chance to escape the working mom life, I tend to binge watch. I will be so captivated that the busy world that surrounds me seems to disappear, that is until the dogs start barking to go out or one of the kids burned something in the toaster, and then I feel guilty....but then I tell myself, No guilt...Just Inspiration. Inspiration. HGTV definitely brings it. When building our house HGTV was my #1 source for design ideas. I get so excited about all of the design options that are available and love to inspire others to think outside the box when it comes to the design elements in their home. One of the most important decisions that you will make in your home is the flooring. The options can be overwhelming if you have no idea what type of look you are going for. Farima Alari of HGTV has compiled a list of 10 Stunning Hardwood Floor Options and I have to admit they are all stunning! Click here view HGTVs options and be Inspired!